The installation will prompt you to give values for various parameters. The database_user, and database_password will need to match what you have set up. 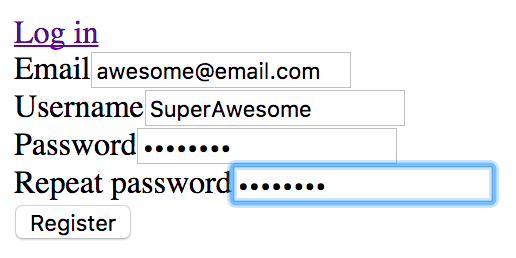 Give the mailer_user parameter an email address value, as we’ll need it later. This does not need to be a valid email address for the purposes of this walkthrough. If you’ve setup your database to use a different port, be sure to override that default. You’ll also want to override the default secret with a random string before putting any Symfony project into production. The defaults for the other parameters should be fine. Don’t worry if you make a typo or accept a default you didn’t mean to. You can overwrite any of these values in the project’s app/config/parameters.yml file later. The parameters.yml file is created by the install process based on parameters.yml.dist which acts as a blueprint. As a best practice, the generated file parameters.yml is excluded from repositories as it may contain private and server specific information. You can verify a successful install by visiting the default landing page. If you have a web server configured visit http://localhost:8000 or the assigned virtual host url. 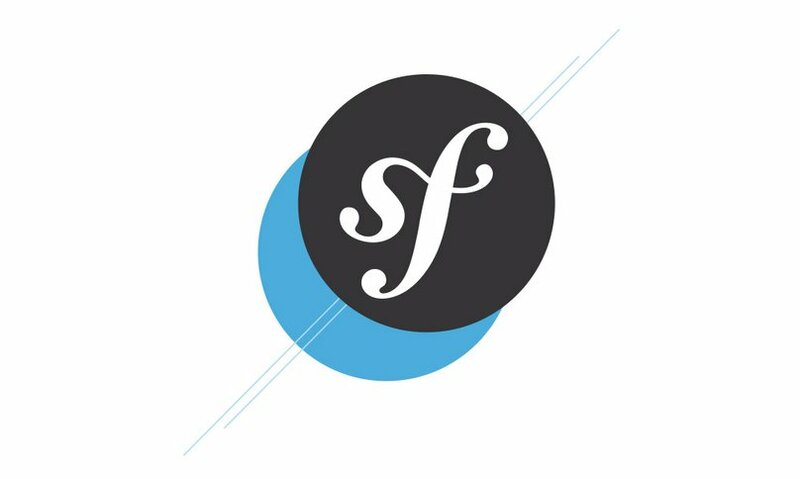 Symfony assumes you are in development and includes a web debug toolbar at the bottom of your project pages automatically when using the built in server. If you are using virtual hosts you may want to comment out the highlighted lines below in the project’s web/app_dev.php and add /app_dev.php to the url or update your virtual host server config to use app_dev.php in the location so you can access the web debug toolbar. 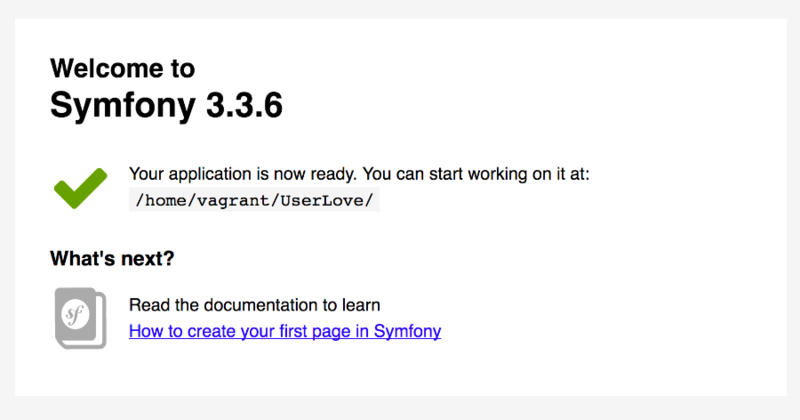 Now you have a Symfony 3 project, but it doesn’t do anything just yet. You can add a lot of basic functionality for users by installing and setting up the popular Friends of Symfony User bundle. Once the install and setup are complete, your project will be able to have users register, login, and view or edit their profiles. The mailer_user parameter already exists, but we’ll need to create the mailer_name parameter and add it to the existing parameter list in app/config/parameters.yml.dist. You will be prompted to give a value for mailer_name when you install the user bundle. The ORM annotations will tell Symfony’s default ORM – Doctrine, how to update the schema the database is built from. Just before the class declaration there are ORM annotations which declare this class an Entity and associate it with a table named fos_user. Above where the protected $id variable is declared there are additional ORM annotations declaring it an Id, making it a column of type “integer” and making it an auto generated value in the fos_user table. Enter a value for the new mailer_name parameter when prompted. The FOS User bundle includes routes for actions like login, logout, and register, but they need to be imported into the project’s routing.yml. You have successfully installed and configured Symfony and added the Friends of Symfony User bundle for user registration, login, and edit capabilities. You’ve made amazing progress on your next web project for users. Moving forward you might incorporate the FOS User bundle forms into your project’s style, expand the User attributes, install additional Symfony bundles, and of course writing tests is always a good idea.